It's an average day. You get to school in the morning and go to your locker as usual. But something just doesn't feel right...When you open your locker you see a bright white flash of light and then everything goes dark! When you regain your senses you are lying on the side of a hill. You sit up and hold your hurting head. Your eyes slowly focus on a city in the near distance. It doesn’t look familiar, it seems to shine in the sun. The air is warm and smells of salt water. You have been transported back to ancient Greece. 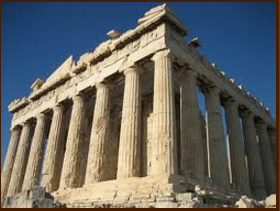 Before you, is the city-state of Athens or Sparta. 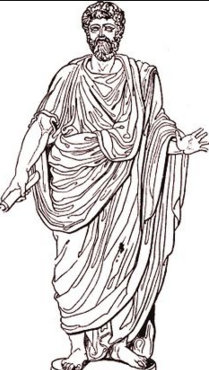 Your clothes have been replaced with a toga and as you make your way through town, people greet you as if you are suppose to be there. In the pocket of your toga you find a piece of clay with strange markings on it. After asking around (you magically speak and understand Greek) you find a scribe. 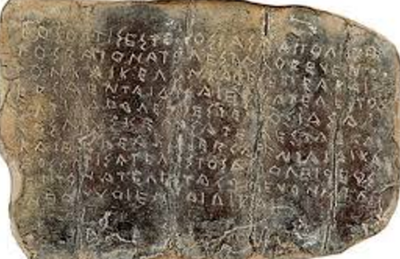 The scribe takes the clay tablet from you and tells you what it says.